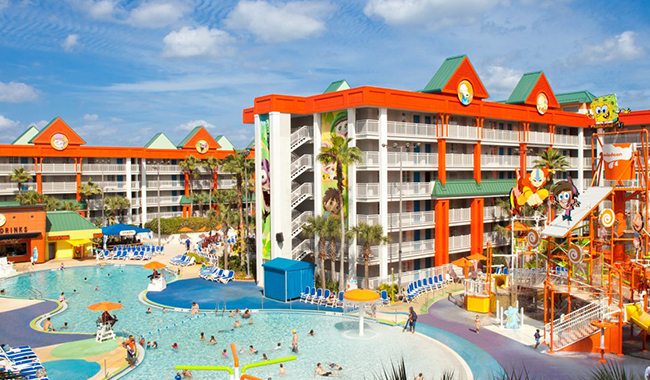 This whimsical all-suite Nickelodeon resort is 1.9 miles from Walt Disney World®, 6.8 miles from SeaWorld and 10.1 miles from Universal Orlando. The 1-, 2- and 3-bedroom suites sleep up to 8 guests (in double beds, bunk beds and a pull-out sofa) and all have flat-screen TVs, dining tables and kitchens/kichenettes with microwaves and coffeemakers. Upgraded rooms offer Nickelodeon-themed wall art. The resort has 2 water parks and a kids’ spa. There are multiple dining options, including breakfast with Nickelodeon characters (surcharge). A resort fee covers WiFi and shuttle service to Walt Disney World®.